Thread in 'Discussion' started by Qlex, 17 Jan 2016. I think I'm going to make a revision on my goals for this year. They weren't ambitious enough. Here's hoping I can even meet one of these! It's gonna be tough. Edit: 0/6 revised goals done. Crap. Reflecting on my goals is easy. Didn't get a single one. As for my progress, I'm at 1/8. I haven't tried the one hand TGM GM though, nor given much effort to the Shirase and Death secret grades. I did get a GM secret grade in TI master in 76 levels though, which is way better than I was expecting. I'm getting closer and closer to cracking 8:45 and 700+ as well, it looks like it'll happen soon, and it's just a lucky sequence away from a secret GM in TAP, I've had many S8's and S9's at this point. TI master and Shirase doesn't look like much is happening for me there. I've gotten to 500 in TGM1 a few times now but not been able to hold on for much longer after that, so I decided to switch gears and try to hit some incremental milestones in Death so I can get better at making piece decisions and movements faster and more consistently. Finally got to 200 without being three seconds away from topping out! It was the first time I got through the entire 100 section and felt totally in control and dealt with the jump in speed confidently. As long as I had the destination for the piece already set to go in my mind before it dropped I didn't really feel at risk of it getting away from me, and I can kind of see more clearly how it's possible to play at the much higher speeds. So I'm hoping that this practice at a faster speed than TGM1 ever reaches will let me make fewer errors when I go back to it, as long as I learn to stack to accomodate the randomiser better. Qlex, mycophobia, FeV and 1 other person like this. Same here, I recently hit 500 on TGM1 and 150 in Death. I hope to get better and beat TGM1 soon. Goal progress: 0/6 and it's August. Darn. Mine are tgm gm, and death 300. I failed my death 200 goal this year cause ive been super busy, but got pretty close on christmas eve getting 191. Once i get 200 consistently im going to attempt tgm gm. I also have plans for other training methods if i ever get time to do it. Registered here in 2013, a year after got a TGM1 board, another year I posted this (3 years ago). So after 5 years of playing this game I finally got GM and broke death 300. Pretty happy with myself, and hope to keep improving. What really motivated me (apart from being off work) was seeing the TC crew at CTWC, I hope to go next year. mycophobia, Echo and JBroms like this. FreakyByte and simonlc like this. Completing GBTris 9-Heart 5... with at least one Tetris. If that won't work out, then at least with a Triple. I mean, I completed that before, just not with a Tetris or a Triple, so that'd be cool I think. I expected someone to reply in the meantime, but I for one actually managed to clear my goals. FreakyByte, Qlex and xyrnq like this. Missed most by quite a small margin, like 6:09 and 442, but hey I managed to visit Eindhoven again and even bring some more friends and do my own small mini meeting. So maybe I can do those small improvements next year. Also looking forward to visit an arcade on my trip to tokyo next summer. Hopefully get close to or beat the torikan in Shirase. Got the death M, sub 8:45, didn't get 3, did 4, 5, smashed 6, got an M3, did 7, 8, didn't get another stick, and I did 10! The minimum number of levels required to get a secret GM is 53! 2018 objectives to be decided on later. More maths will be in it though! TAP Death GM: Got it. TAP Master GM: Still stuck on the $#&*@ invisible roll, so no. Frustrated enough with it that I'm taking a break. 2017: Didn't have specific goals, but I'm happy with my progress so far. Get a TAP PCB? Maybe? got the sub-11 tgm1 at least! All in all for 2016, I feel like I should've invested more in skills that, you know, normal people would actually be impressed by, but I had fun. 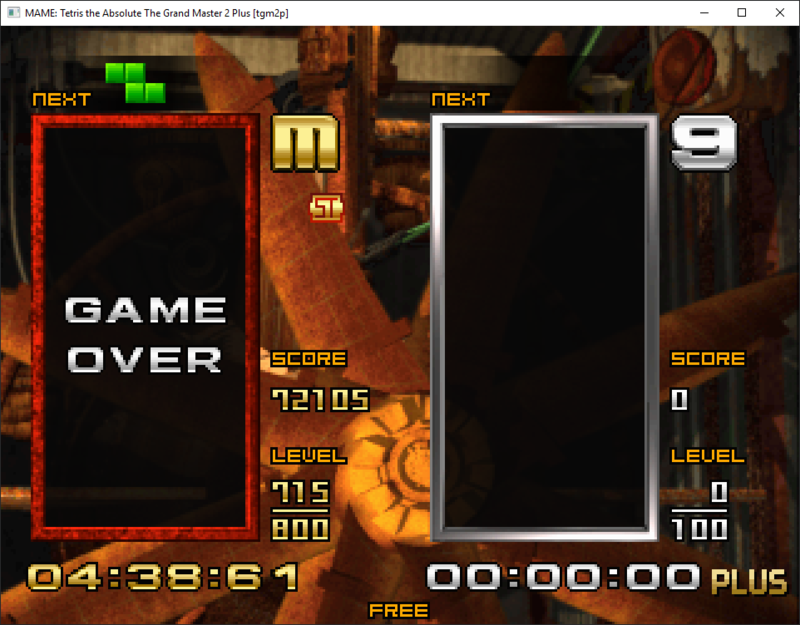 Getting a sub-9:40 TGM1 GM was a big surprise for me this year. When I heard Kevin say SAL does the Kashiwa strategy by building the well in column 8, I crafted my own setups for it, then the run just fell into my lap the next day. Welp, guess we're still using the 2016 thread instead of making a new one! -CCST routing + 'decent' runs for both NG+ categories. FreakyByte and Oliver like this. FreakyByte and Archina like this. >Orange S13 I know I can do it. >Nope, just barely missed it with a PB of 11:03:35. Still a good climb, though. >Nope, I had a few more S9s but even my best is a 9:07:58 so there's still much more to go. >Actually, yes. 927 is my best so far. There have been a few crazy runs. >Well I don't have the emulated version any more but I did get Fading MK on Texmaster so that's something at least. >Yes, it happened. It was awesome. So, what are my hopes for 2018? >Let's be greedy and say sub-10:40 in TGM. >TAP M grade because there's still plenty to go there. >Death GM. This shouldn't be further away than a year for me, it's just a matter of dedicating myself to it. >Fading MV and Invisible MK in TI Master. Very much possible for me to get either, just need to focus and play well. >Sub-4:45 Orange Line S13 in Shirase. Extremely difficult but I know I will always be dreaming of it.